Traveling cat spotted on the roof of Random House in London, England. I'm sure you already know the cat's name - Bob - as he is one of the world's most famous cats. 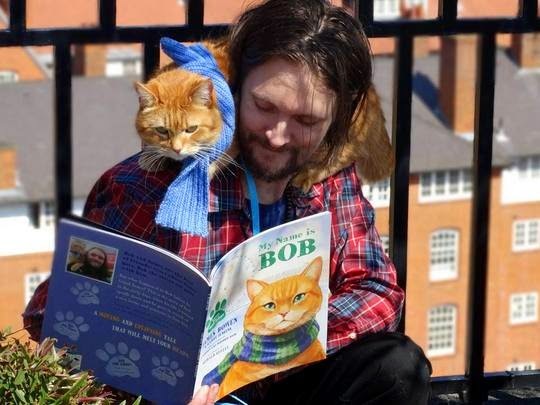 If you haven't read their adventures A Street Cat Named Bob and The World According To Bob, you should do so now because they are the most heartwarming cat books you'll find. In the top picture, they are reading My Name Is Bob, their latest picture book about what Bob's life was like before he found James. Love Bob and his story. Nice one. Have a super Saturday. Ah, ce chat là, je le reconnais ! ;) C'est le célèbre Bob, qui a rendu célèbre son maître !!!! Une belle rencontre, une belle histoire ! I'll have to look into those books, thanks! 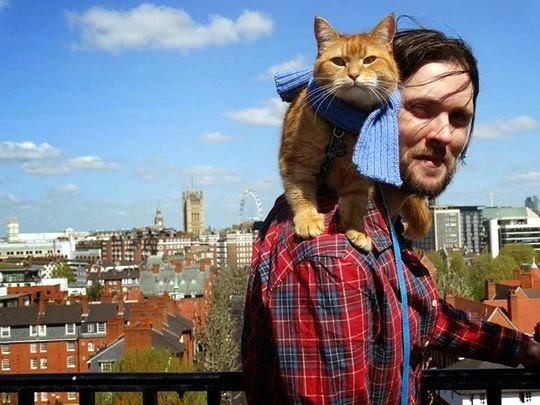 Great cat scarf! I love the story of Bob the cat, very sweet and cute kitty. I heard James interviewed on the radio and now I want to read the books. Some day when I have time . . . . I have indeed heard of Bob. Very dapper in the blue scarf. Sweet! Il a l'air sympa ce Bob. En plus il est comme Hisia, un "shoulders cat" ! James and Bob's story is a terrific read! What a cute gingew kitty. I really want to read those books but haven't done yet. Never heard of the books, will look into them. Great post! Thank you for sharing. The scarf on Bob is too adorable! Visit www.atcpetsupplies.com - We have been consistently delivering value and convenience to pet owners around the world! Aww!!! Great shots!! love the blue scarf! everyone has read the books but me, which is rather astounding considering the vast number of cat books that I have reviewed! Aww we will have to check it out! Love these photos!! Bob is so handsome, especially in that scarf. We will have to check out their books!